Antiques, furniture, fine art, accessories, collectibles, garden furnishings, faux floral arrangements ... Kevane & Company is your one source for all of these. Our design visions draw inspiration from around the world and our gallery reflects this broad reach as well - Turkish carpets, European Porcelain, period furniture, unique Americana collectibles, luxurious Chinese brocade and fine craftwork from the studios of local artisans. 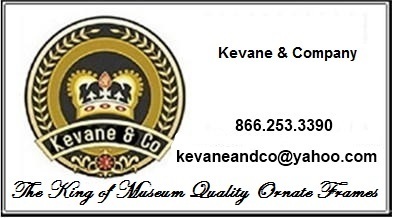 Customer Service: Call or e-mail us at kevaneandco@yahoo.com. For smaller orders (as respects size and weight) we tend to use Federal Express, though we may from time to time use other carriers, for larger orders we use individual transportation firms on a case by case basis. If possible, we will ship overnight at your request, but you must contact us for the rate for overnight shipping. If you are not concerned about the rate for overnight shipping you may order your merchandise over the internet and include a note to us letting us know that it is OK to charge for overnight shipping - we suggest you give us a reasonable ceiling (either as a percent of your order or a flat dollar amount that you are willing to pay). We will only charge you for additional shipping if the item or items are available for overnight shipping and the amount is below your ceiling. Otherwise your order will be processed according to our normal rates and procedure. We carry a number of items that are more expensive to ship than our shipping rates alone contemplate. In addition to those shipping rates these items also carry a freight surcharge. This freight surcharge is designed to coordinate with our shipping charge for a total freight and shipping cost. Furniture is very expensive to ship. We have to specially repack all of our furniture for freight. As a result we will charge additional amount for furniture orders under $1000 total. We also have to charge additional freight and packing charges for orders of single chairs, benches, stools and settees. Unfortunately, it is particularily expensive to ship individual items by freight. All of our prices are subject to change without notice. That being said, please understand that Kevane & Company maintains an enormous catalog of items for sale; because of frequent price changes from our manufacturers (some of which are without notice to us) it is necessary for us to include this caveat. Additionally, and from time to time, we may have simple data entry errors - generally these are obvious mistakes. Sometimes these mistakes may effect pricing. In that case, when possible, we will try to honor our original pricing; where that is not possible we will contact the customer as soon as possible after discovery to work out a resolution or arrange for a full refund. We are proud of our collection, stand by our merchandise and sources, and want you to be perfectly satisfied with your purchase. All KEVANE & COMPANY merchandise is guaranteed. If you are not satisfied for any reason, we will gladly provide a Kevane & Company credit for your item(s) returned within 30 days of receipt. If for any reason there is nothing in our inventory that you would like to apply to your credit then we will return your money to your credit card less a 20% restocking fee. We do not refund shipping or freight surcharges. After 30 days, Kevane & Company will replace or refund your merchandise against manufacturer defects for up to six months.